Today's post is a random accumulation of images from the last few weeks. 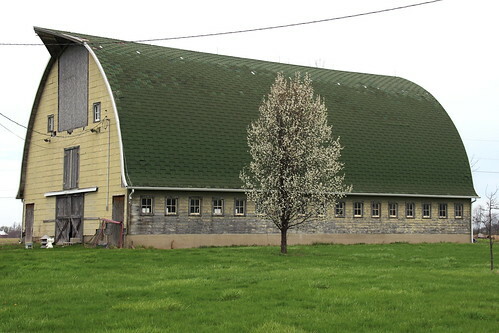 First up is a wonderful old barn that I pass several times a week. It sits beside a state highway in an area which is rapidly being overtaken by retail stores and other businesses. The property is for sale, and I fear it's only a matter of time before this beauty is only a memory. Some of you will remember my talking about Doug's brother, Dennis, who underwent a partial amputation of a leg in 2014. His daughters and their families live a few hours north of Dennis and haven't seen him since his hospitalization three years ago. We live a couple of hours south of Dennis and see him about once a month. 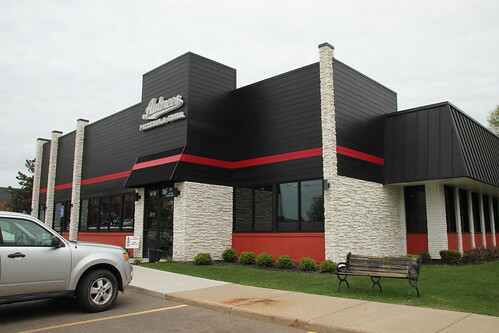 Well, on April 29, several members of his family to the north met us and Dennis at Aubree's Pizzeria and Grill in a town approximately an equal driving distance for them and for Doug and me. Dennis is in the green jacket, between his oldest daughter, Denise, and my hubby, Doug. Dennis' middle daughter, Becky, is across the table from him, with the man in her life to her right. On her left is Denise's son and his wife. 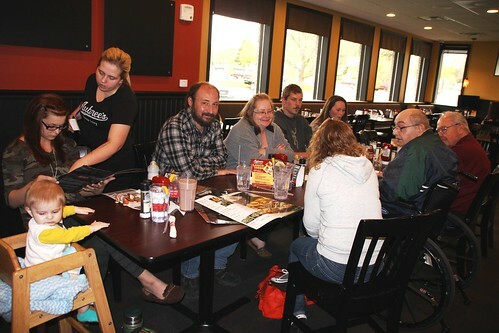 And Denise's daughter and her little son are on the left end of the table. It was a special time, and I hope we'll be able to do it again sooner rather than later. Also, those of you who have been around awhile will remember my great-nephew, Carson, who is active in music, drama, and dance. 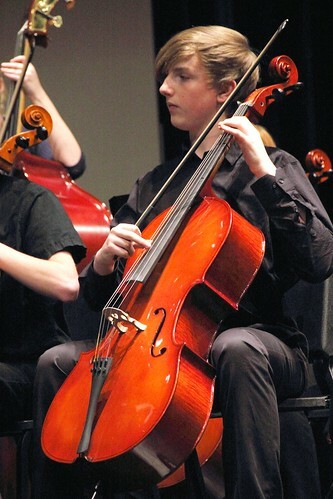 On Tuesday, May 2, Carson performed with the high school orchestra in their last performance of the school year. I understand that it was probably Carson's last performance with the orchestra, too. He's considering playing keyboard in the school band next year. And lastly in this random mixture, a look at the front of our house and our beautiful azalea bush. The azalea bush was very small when we bought the house 28 years ago. It's grown considerably in those intervening years. And it just glows when it's in bloom. It's such an eye catcher that we notice the Amish checking it out as they drive by in their buggies. It's about the only time of the year that they pay us much notice. The barn is a lovely building.It would be nice of it could be re-purposed for some other use. I have seen a couple of barns in my area, turned into homes.You certainly have a beautiful home. Thank you, Ruth. 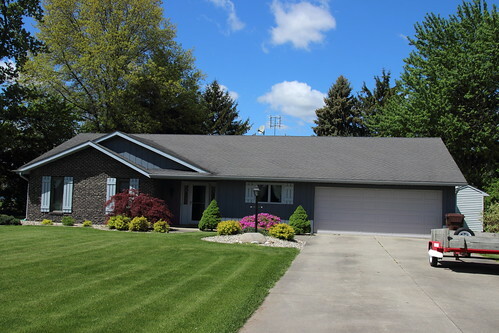 The credit for the attractiveness of our home goes wholly to Doug. He's diligent about taking care of things. I appreciate him so much. As for the barn, I'm afraid it's doomed. I'm sure that the owners of the property are intending to sell it for commercial purposes. I love old barns. It looks like yall had all kinds of fun. Love your home. As you can see, I love old barns, too, Kim. Thank you for the kind words about our home. No matter if random or purposeful your images are always great showing nicely your corners of the world. Have a great Sunday. Thanks, Mersad. Hope you've had a good Sunday, too. Oh my, Linda, your azalea is gorgeous. I'm partial to that color and actually have three of them, but mine are very scraggly looking and will be removed as soon as Goodman can get to them. He took down five huge holly bushes last week, but since he is still working he does these projects as he can. I'm so glad your brother-in-law got to see his family. It's sad that families seem to be separated by their lifestyles in our modern times. Thanks, Toni. 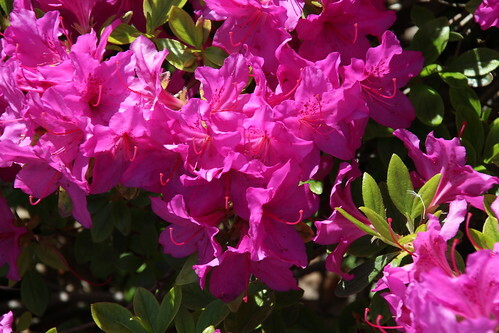 We always look forward to the blooming of that azalea, and it's never disappointed us. I wonder if yours might be a different kind. We've never "groomed" ours in any fashion, afraid of spoiling a good thing. I love holly bushes, and it seems the mockingbirds like them, too. We don't have one, but we've talked about trying to grow one. Dennis and his wife divorced when the girls were still young; and the geographical distance has been a deterrant to frequent visits. Hopefully, though, we can get them together a little more frequently, now that we've had one successful meeting. I absolutely love this series, Linda, and the last photos are a perfect and gorgeous way to close your post. And thank you for sharing an update on Dennis as well. Thanks kindly, Linda. An update on Dennis was long overdue. I enjoyed your hodgepodge very much. Your azalea bush is gorgeous. I hope the rest of Dennis 's family will make the effort to see him more often. You're very kind, George. That azalea bush almost hurts your eyes to look at it. :) I hope we'll be able to get Dennis and his family together again before too much time passes. Love those azaleas, they are so exotic.Wish they lasted longer. Thanks, Steve. I wish they'd last longer, too. But I'm grateful for the time we do get to enjoy them. It WAS a fun time, Betsy. I think we all enjoyed it. Don't be too hard on the family members for the infrequency of their contact. There are contributing factors that include distance, busy lives, and divorce. I was grateful that so many of them were willing to make the long drive to spend a few hours with us. 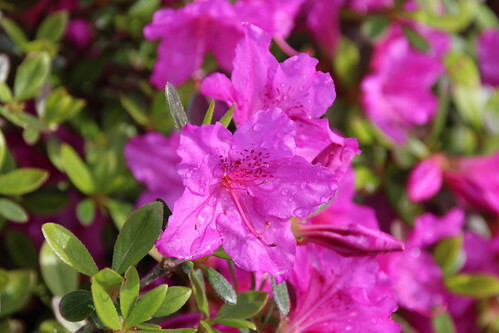 Thanks for the praise of our azalea. Sorry to hear about the negative results of the drought-related stress on yours. I loved reading here this evening. It is a shame how much of the farming community is being overrun with businesses. I grew up on a dairy farm and it saddens me to think of how many are disappearing. How wonderful that your brother-in-law and extended family were all able to get together and enjoy time of fellowship together. Making memories! I enjoyed reading about your great-nephew. Those last concerts of the school year can be a bit melancholy but he will be a part of it all next year...just in a different aspect. Your home and lawn are beautiful, Linda. That Azaela is gorgeous! Hi, Dianna. It's true that many farms are being taken over by residential housing or by retail stores. Even on those farms that remain, the beautiful old barns are being replaced by pole barns. I understand the reasons, but I hate to lose that part of our culture. Times, they are a changing. Carson and his brothers are talented kids. The three of them wound up going in three different directions with their interest. Carson is our artsy one. Thanks for the kind words about our home and lawn. Doug gets the credit for that! We have two azalea bushes. One with read blossoms that haven't opened yet and one with yellow blossoms which open earlier and got frozen this year, I was so sorry and surprised to see that. Fortunately its leaves haven't been damaged so the plant seems to have survived. The barn looks very interesting but perhaps it's not that practical anymore. It's quite unfortunate to lose such a sight, I understand your feelings. It's good that Dennis could enjoy his family gathering. I'm also surprised that his kids were not more interested in seeing him earlier but they surely had their reasons. Hi, Petra. It's sad that your yellow azalea was hit with the frost this year but encouraging that it seems to have survived to bloom again another day. I think this barn has been used for storage in recent years. I still see them hauling stuff out of it when I drive by. At one time, they had peacocks in there; and there was once an old conastoga wagon that sat out back. Thanks for the comments about Carson. He's a talented young man. Thank you for the kind words. We did have a good time at the restaurant. Quite an amazing assortment of photos, and beautiful too. Thank you, Gordon. And thanks for stopping by.